Whampreview is changing. I’ve decided to split our dinner evenings into two. Whampreviews will now be smaller affairs and will focus solely on new restaurants or places with new menus. They will be sporadic and attendance will be by invitation only. 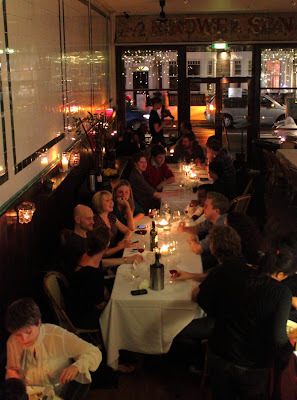 What you know today as whampreview – dinners with typically 24 people – will be renamed #whampdinner. If you have no idea what #whampreview is, then head to the FAQs. From your perspective, very little. Whampdinners will still be groups of 16, 24 or 32. There’ll still be someone ostensibly running the table, but we won’t be actively soliciting your views on the food and the event won’t be written up afterwards. All my usual headmasterly rules will apply regarding signing up, turning up, paying etc. The other change is that Whampdinners will be advertised only via the West Hampstead Life mailing list. Sign up here if you’re not already registered. They’ll be pushed on Twitter only if we don’t get enough people signing up from the mailing list (hint: all recent whampreviews could have been filled solely from mailing list subscribers). Subscribers also of course receive the weekly newsletter and advance warning of other events, including #whampgather. You will not receive more than six e-mails a month. There’ll still be the chance of last minute places coming available on Twitter of course, but if you’ve enjoyed a whampreview before, or if you like the sound of an enjoyable evening of meeting some locals over a good dinner, then do sign up if you have not already. Could new Iverson proposal merge with existing plan? What have I missed since July 1st?